During the late 1990s, marine-composites expert Ken Raybould, based in Southampton, U.K. but consulting internationally, was an important contributor to Professional BoatBuilder’s IBEX seminar program as a speaker and a moderator. For example, at the annual trade show’s 1997 edition, Raybould was a panelist in a two-part session titled “Some Fine Points of Sandwich Construction.” That seminar covered a wide range of technical topics; Raybould focused on procedures he considered fundamental for achieving fail-safe cored construction. Since IBEX seminars are not recorded, and printed handouts of individual presentations were rare back then, what follows is an edited version of Raybould’s own podium notes. His comments below remain as relevant today as they were when delivered verbally to that IBEX audience two decades ago. • Boat designers must be made aware that in many cases, the shapes they draw determine whether a given foam- or balsa-core panel material can be readily applied by the builder. Case in point: complex decks or internal modules do not easily accept cores. Faced with a difficult application, the builder must layer on excess bonding paste or resin to overcome the situation. Or leave out the core altogether. • To minimize gaps in a tailored core while retaining structural (and economic) efficiency, the builder must introduce the core into the laminate in such a way as to anticipate what constitutes an appropriate amount of adhesive. That adhesive should be a proprietary product, but it can also be made in-house. The adhesive thickness needs to be as uniform as possible; otherwise, the resulting laminate could generate uneven stresses. That said, it is better to have a little too much adhesive rather than too little. 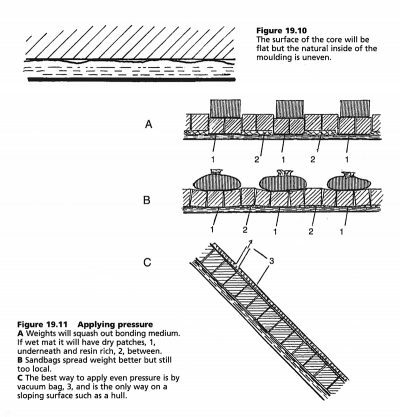 Illustrations on cored construction drawn and annotated by Hugo du Plessis for his best-selling Fibreglass Boats, a book first published in 1964 by Adlard Coles (London) and still in print. Du Plessis has continually updated the text to keep pace with FRP technology. A review of the latest edition appears here on this website. Variations in adhesive thickness will depend not only on core thickness and drapability (contour type) but also on minimizing the overlap buildup in the skin (fabric reinforcement) where the core is to be placed. All gaps within and between core panels must be completely filled with adhesive. The grid score is there only to facilitate panel application; the core then needs to be, in effect, rejoined to itself to its full depth. • To enable cored construction to reach its engineered potential, the core must be kept in good condition. Cores covered in dust from grinding and sanding, or contaminated with moisture, will not be able to work efficiently in conjunction with a bonding adhesive. Whether proprietary or made in-house, the bonding adhesive must achieve cure if it is to be effective. Often too little catalyst is used, and then not sufficiently mixed. Shop-floor personnel must keep in mind that, because they can’t possibly see what is happening at the interface between the skin and the core, they are in fact working blind when placing cores onto adhesive bonding paste. 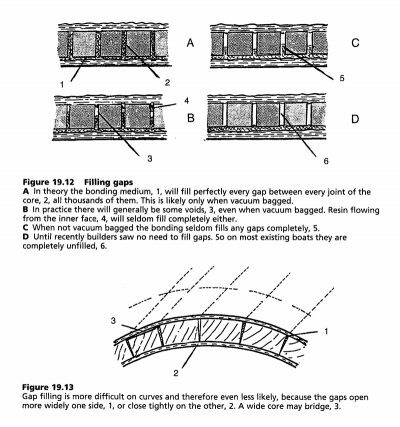 • Vacuum-bagging a core in place has many advantages, but can also be a nightmare if personnel are inexperienced with the process. The techniques should be learned on small parts first. Once shop-floor experience has been gained in bagging, there are still a number of things to consider—and understand. For example, full vacuum; it can function as friend, or enemy. For conventional sandwich construction, full vacuum should not be necessary other than to evacuate the bag in the beginning of the operation. Then, immediately reduce vacuum so that it is just holding the core firmly in position. The vacuum bag should not be enlisted to expel excess resin or core adhesive. That’s bad practice. Full vacuum causes rapid air changes: since most large bags (for large composite parts) are not 100% airtight, vacuum thus prolongs gel time by lowering temperature. Also, over a lengthy period of time, full vacuum may draw off too much styrene from styrenated resins (polyesters and vinylesters). Moreover, prolonged full vacuum tends to migrate wet resin toward the bag surface and separate any solids from within a bonding paste at the interface between the core and the fabric reinforcement. Either or both of those events result in poor adhesion between core and skin, and possible undercure. It’s not uncommon for all the bagging problems described above to manifest themselves at one time—without anyone on the shop floor being aware of it. • Manually mixing catalysts into pastes and putties takes longer than generally thought—due to volume, and viscosity differences. How long? Plan on 5 to 8 minutes by hand to mix 1% of catalyst thoroughly into a 1.5-gal (5.7-l) pail of resin, and longer than that for a viscous paste—in order to eventually achieve uniform cure. To achieve cure in pastes and putties, a weight or volume of a specific type must be known in order to determine the catalyst content required. And then the batch needs to be thoroughly mixed. To prove the point of this very important issue of mixing, try mixing 0.5 gal (1.9 l) of white gelcoat together with any dark-color gelcoat or pigment paste—equivalent to an amount of 1.5%. Note how long it takes to fully integrate both colors. This exercise will give a better understanding of the mixing requirement. • In the aircraft industry, film adhesives are used at all interfaces between cores and skins. For those interested, this can be accomplished in marine applications by pre-applying a suitable resin system to the core—say 6 to 8 fl oz/sq yd (212.2 to 283 cc/m2)—and allowing it to kick just prior to finally putting the core into place. Resins with an elongation of 5%+ are suitable candidates. If you do choose a coating system of this type, remember to fully catalyze and thoroughly mix the resin, since the amount of resin involved creates only a thin film. Note that full cure will be dramatically affected by shop temperature, core temperature, and by relative humidity at the time. Being aware of the various considerations cited above goes a long way toward ensuring that a marine design calling for cored construction will perform as anticipated. About the Author: Paul Lazarus is Professional BoatBuilder’s senior editor.